The first severe thunderstorms of the 2017 season have been reported. 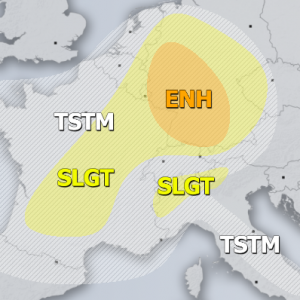 The persistent cutoff low over the western Mediterranean produced the first severe thunderstorms of this year’s season. Severe thunderstorms, with severe winds including tornadoes, and hail hit parts of Sardinia and Sicily. Conditions were favourable for formation of severe thunderstorms, as significant instability (for the season) with up to 500-1200 J/kg MLCAPE was locally available, combined with a strongly sheared environment. Sicily was also hit by severe thunderstorms, which produced locally very heavy rainfall and flash flooding. Lightning plot over 48h during this weekend (Jan 21-22) shows distinct convective lines affecting southern and eastern Sardinia and Sicily. Plot: Blitzortung. The cutoff low is still ongoing over W Mediterranean, gradually filling. Scattered thunderstorms are ongoing in the core of the system over the Balearic Islands, producing limited threat for waterspouts.